I have been trying to get things organized around the house lately, so have spent little time outside. I was able to get out on an Allen Marine tour Tuesday evening, and saw some interesting things (the photos are from that trip). Weather: Weather has been overcast with periods of rain. Highs have been in the low-to-mid-50s. There has been some wind, but not too much around the house. On the tour, it was fairly rough in places exposed to the sound. It seemed to me the waves were coming out of the south or southwest, but I am not sure. Notes from the Tour: On the tour I saw a number of Marbled Murrelets. It was a little rough to try and get pictures, plus in a boat so large, they did not stick around for us to get close. 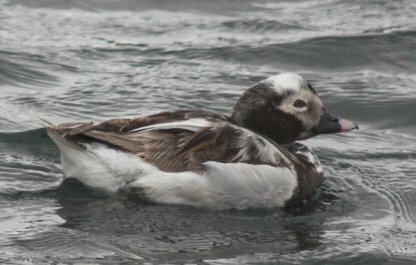 I was able to see the Long-tailed Duck that has shown up in the channel (see photo below). A long-time local birder said this is the first one she has ever seen here in the summer, though they are fairly abundant in the winter. We were able to observe an active Bald Eagle nest. One of the adults flew in and was feeding its young. 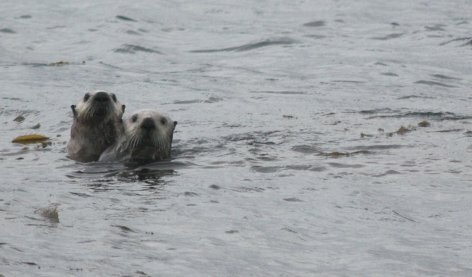 There were several sea otters with pups that we were able to observe as well. This entry was posted in birds, daily, photo. Bookmark the permalink.